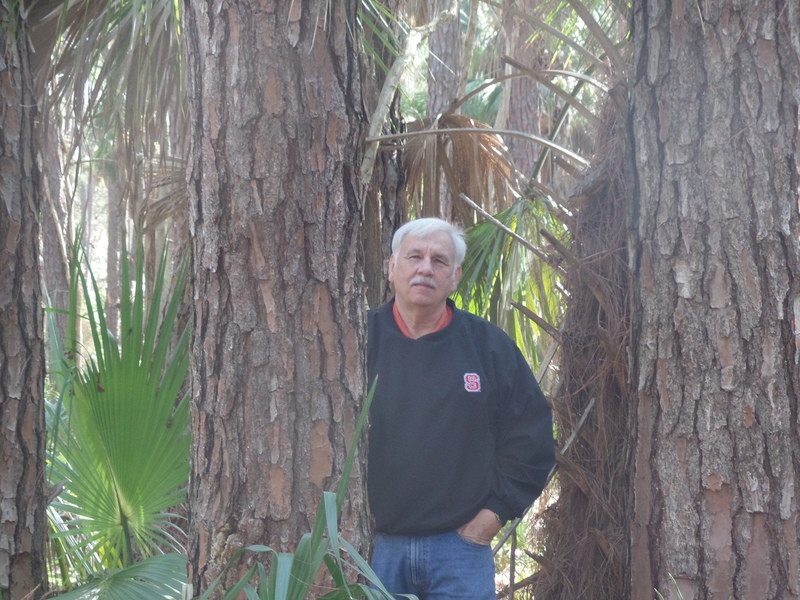 January 2015 – Page 2 – Let's Go RVing! Jerry got up around 6 and I stayed in bed until 6:15 but I was cold and knew I couldn’t go back to sleep so I got on up. We both weighed and darn it we continue to gain weight. Although I have admittedly gained weight I don’t think the scales are correct. I weighed several times today with heavy clothes and without and weighed the same. Oh well. Jerry hooked the car up on the dolly and now within 15 minutes we could pull out except we have another hour to wait. Nope – by the time we got ready Donna had knocked on the door and they were ready. They are really good traveling companions. We pulled out around 9:15 headed for St. Augustine. Neither Ken nor I could find the address in our GPS but we knew it was off of I95 and he said we turned on Route 16 so we headed on. We traveled about 3 hours until Ken needed to stop for gas. We got a snack at Wendy’s (French fries) and headed on. In the meantime I had gotten the Good Sam’s Camping Book out and located our campground with a more detailed address. 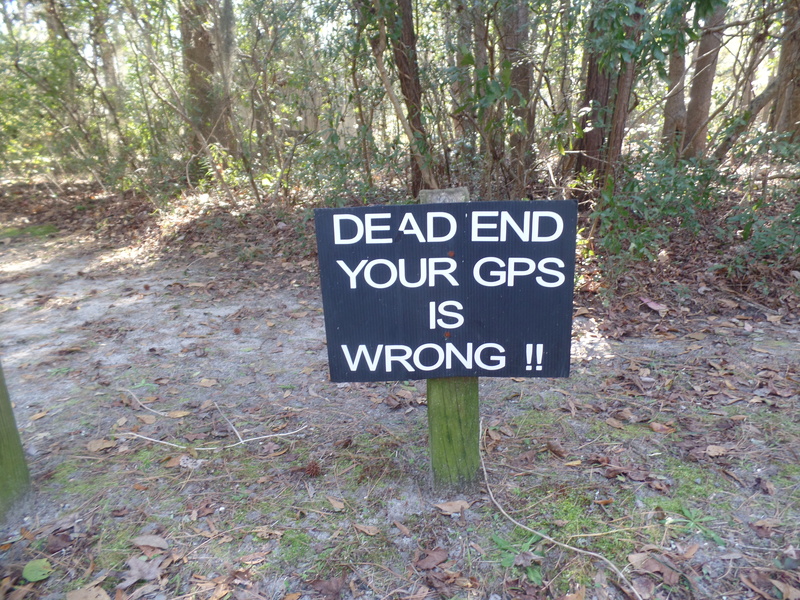 I put that in the GPS and we got the correct directions. 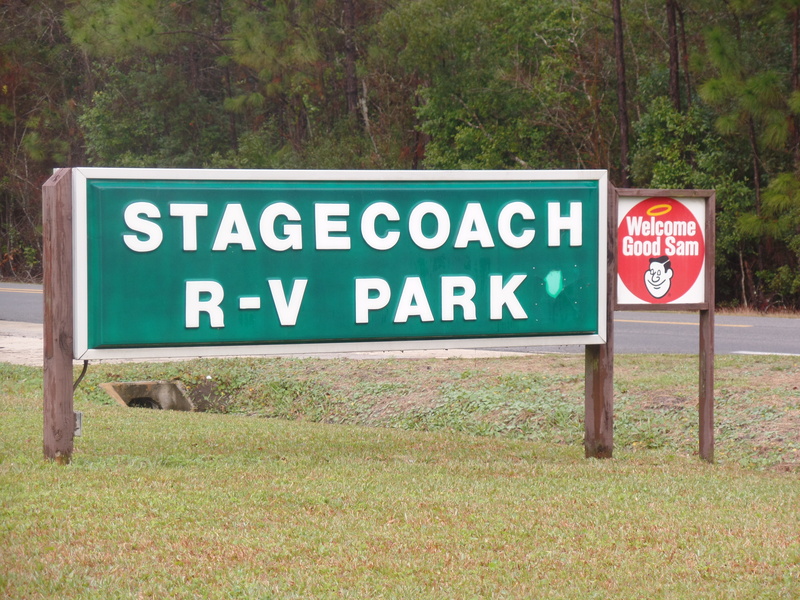 I also put in the name of the campground and got the same directions so I knew we were good to go. We arrived about 1:00 and got settled and then left a little before 3:00 and rode into St. Augustine. We found a parking place and then spent some time just wandering around the streets. It was so cold and we were not dressed for it! The streets were crowded and we did see some strange sights. We went in the trolley information booth to see what tours they had to offer. While Donna, Ken and I listened to the guide Jerry stood outside. We all bought tickets to ride the trolley for three days – actually only two since we’ll be leaving Tuesday. When we stepped outside of the booth Jerry’s response was that he didn’t have to pay $66 to see strange sights – he had been seeing them the entire time we were in there. The one he talked about the most was the young girl who had dyed her hair gray. With half the world his wife included trying to cover gray there was a young girl dyeing hers gray. What makes the world go around I guess. We wandered in and out of the shops for a while and then went to the Columbia for dinner. It was a Spanish restaurant and we had no idea what to order. We all ended up ordering tapas. Before they were served we each had a “hunk” of bread. When they gave us our individually wrapped bread I knew that I wouldn’t eat it all. Wrong. Good butter and good bread and yes, we ate it all! Jerry and I had shrimp, crab cakes and pork ribs – what a combination and I was afraid my stomach might revolt but it was good and we enjoyed it. Afterward we returned to the car and headed back to the campground. Goodnights were said and shortly afterward I was in bed. I really have slept well on this trip and I surely hope it continues! Another cold night although it wasn’t quite as cold. Since we didn’t have to wait as long for things to begin to warm up we ate our coffee, showered, dressed and were on our way. Our first stop was at the “dead end. Your GPS is wrong” sign simply because we wanted a picture of the sign. Needless to say Jerry sent it to everyone saying his navigoddess had failed again! 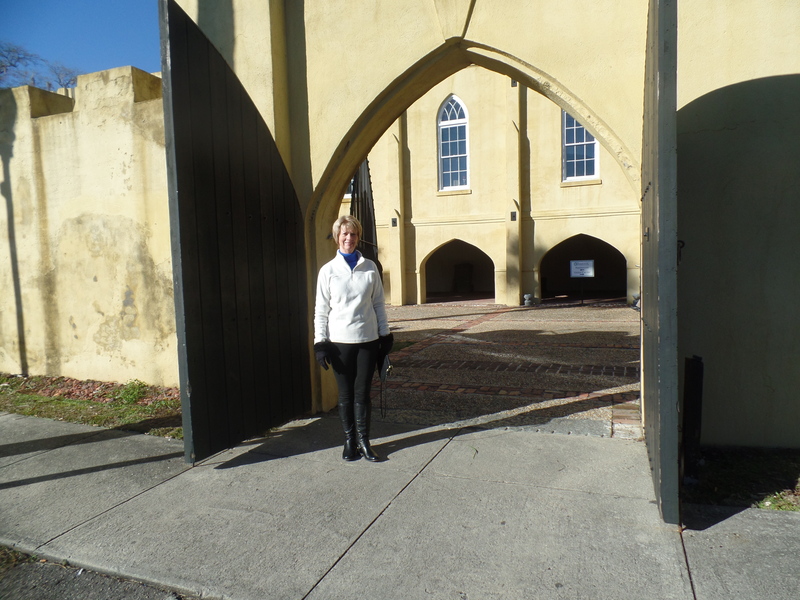 Then we headed on to Beaufort to see the Vernier House but wouldn’t you know – it was closed for the day. Someone later told us it was probably because of the cold. We decided to just stroll down the street of Beaufort and our first stop was the Mary Tibault Art Gallery. Wow – she is really good and had some art that would fit right in at the river. Although affordable it did not fit into our budget at this time. She was not there but another artist Mary Jane Martin was and was absolutely delightful! She spent a lot of time talking with us and then gave us lots of ideas of things to see and do on this cold wintry day. She was painting with acrylics but Jerry asked her about painting with oils and she gave him some good information about drying times. Sometimes it can take an oil painting a year to cure before the varnish can be added. Another picture in the trees! At her suggestion we headed for Hunting Island to see the Lighthouse there. As we traveled along we went through Lady’s Island and Helena Island. It was a lovely drive but sights are very similar to what we see as we jet ski along the Pamlico and Pungo. We went over two swing bridges (they open for water traffic) and then we went over an extremely narrow bridge. I can’t imagine driving an RV over there. It was touch and go with a little car! A sign indicated no parking. Really? We went to the Hunting Beach State Park with an admission of $5, no senior discount unless you live in SC. 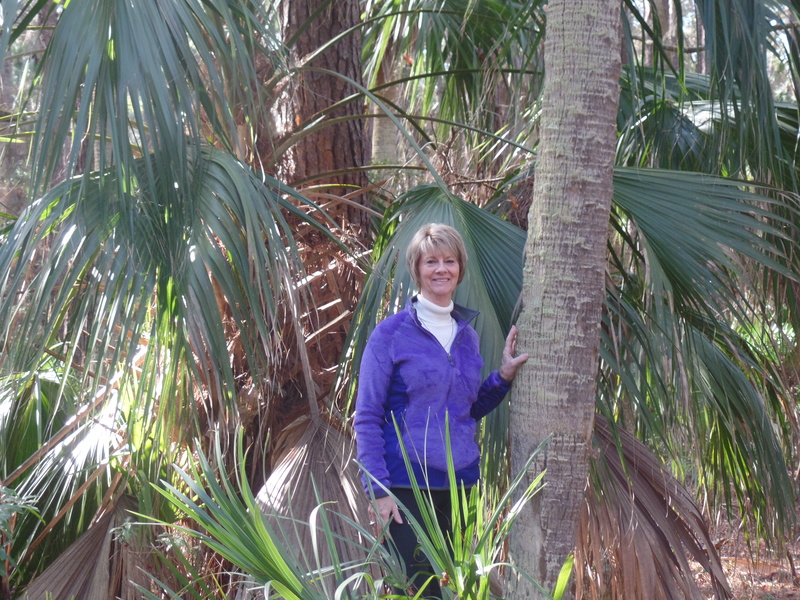 As we wound around the road we stopped and took pictures among the palmetto trees and then headed to the Visitor’s Center where we watched a brief video on the history of the lighthouse. 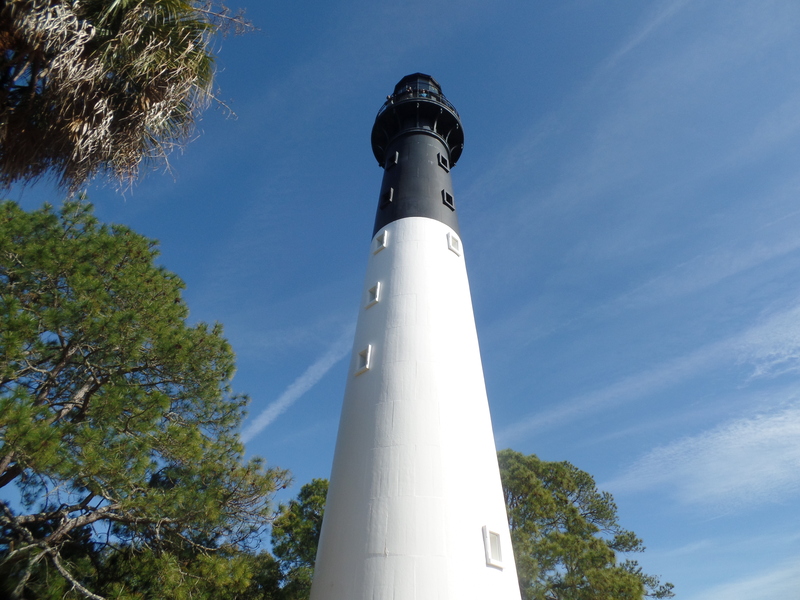 One story was told by a gentleman whose dad continued to man the lighthouse during a severe hurricane to keep the prisms shining so ships would not hit the shore. Afterward he was blind for two weeks and was hospitalized and then wore glasses for the rest of his life. That’s commitment and rarely seen today. We continued to wind around the road. Fortunately it was all one way but interestingly enough the speed limit was 20. Jerry went 10! We went to the lighthouse and wandered around outside but did not climb it. Although according to the scales I really need to exercise A LOT we declined to pay the $2 to climb up. We walked out to the beach where the ocean was eerily calm. It was reminiscent of what we saw at Jekyl Island some years back and again parts of it reminded us of the Pungo shore. Since it was so cold we didn’t stay long, got back in the car and ate our lunch – Atkins Bars (they aren’t working) and then headed to the Port Royal Marine Center. Along the way we saw a Best Buy so turned in there to get an adapter for my SD card in the camera. It was the smallest Best Buy I’ve ever been in and they did not have an adapter. So on to the Marine Center which was located in Port Royal. Oops – after being unable to locate it on the GPS I did a search on my phone. Seems it’s not in Port Royal but in Okatee – who knew? An hour later we found it. It was interesting and had we only ridden 15 minutes would have been worth the drive but maybe not so much after an hour of going who knew where. The guide there was interesting and gave us a lot of information initially and then as Jerry wandered around she gave me a lot more information – she has two children, her husband’s passion is fishing and they are expecting a granddaughter in July, Yada, yada, yada. I really wanted to wander around too! After that we headed back to Yemassee to the Frampton Plantation to determine if we wanted to buy the wall hanging. Both Jerry and I decided if this bird on top was not included we would not buy it. It was included! There were several things there I would love to have bought for the river but we have already spent more than I planned since we left two days early. We left there and went to the Cider store and bought the delicious relish we had sampled the day before. After that we headed for the big town of Yemassee. Mary Jane Martin had suggested we go because it is a quirky little town with an antique/deli store and a white lightning store next to it. She also strongly suggested that if the speed limit said 25 we better go 25! We found the town and it makes Bath look big. After a quick drive through we didn’t even stopped and headed back to the RV. We drove through a neighboring campground to see what it looked like thinking that if we ever come back this way we’d want to know which campground to go to. Fortunately we stayed at the right one! Appeared to have a lot of long term folks and the spaces were small, close together and yes, muddy! On our way back we stopped at the outlet store for Sabatier knives imported from France. They were nice but we passed on buying and headed to the motor home. Donna and Ken came in around 5:30 and Jerry helped Ken set up while Donna and I visited. When the guys came in we warmed up the sloppy joes and had dinner. Both Donna and Ken were exhausted so they left shortly after determining that we would pull out tomorrow at 9:30. Jerry and I played on our computers and then I went to bed shortly after 9:00. I can’t believe how well I am sleeping and just hope it continues! I knew I would wake up early because I went to sleep so early. Seven hours is about all I can sleep although I would love to sleep eight. I woke up at 4:15 though. The clock was blinking so I knew the electricity had gone off sometime during the night. I checked my phone and it was 24 degrees, not as cold as I had anticipated. I did go back to sleep until 6:15, stayed warm in bed until 6:30 and I smelled the coffee. I quietly got up, went in the den and had a cup of coffee while catching up on my journaling if that is what it is. I knew we had another heater but I didn’t know where it was. The faucet was still dripping so we were in good shape in that respect but I have a better understanding of water torturing. Wow – that drip can be annoying. Jerry had put a sponge below the drip and that helped but I could still hear it. Jerry got up around 8:00 and we were just hanging out. He turned the heat (propane) on and it warmed up quickly in here. Suddenly about 8:50 he said we had no water. Apparently the pipes somewhere are frozen. According to the weather channel the temperature at 8:57 is 20 degrees. Plans for the day have changed a bit as there is no water, no shower. Oh well – time to catch up on some things. It’s not supposed to get above freezing until 1:00. Hopefully this was the coldest night we’ll have. I was feeling pretty confident this morning when I woke up with water – oh well! Update: its 9:02 and it seems we have water now. We’ll keep it dripping. Wonder if I should go on and jump in the shower. I hate to go off and leave a faucet dripping – that doesn’t seem like a wise plan. We’ll see. We ended up spending the morning in the RV. Raye called to ask how Mom was doing. She thought Mom’s ortho appointment was yesterday instead of next week and she wanted to find out what the plans were. We caught up on a lot of the news and actually talked for quite a while. As we were talking Jerry went outside to get the car off of the dolly only to discover that the battery disconnect that he bought had not worked. Yep, dead battery once again so the plan was to first go to Walmart and buy a jump start thingie. In the meantime he went to the office and someone jumped the car. He let it run for a while and after I finished talking with Raye I went out and backed it off of the dolly for him. It’s just a bit muddy outside (and inside now that Jerry has tracked it in) because several spigots had been left on overnight to prevent freezing. As we were leaving we stopped by the office to get some ideas for sightseeing today and of course to find the locations for a Lowe’s and Walmart. No matter where we travel we always end up stopping at those two stores. The first suggestion was the Visitor’s Center at the Frampton House. As we were walking to the house we noticed the Wishing Well with the fountain that was completely frozen. 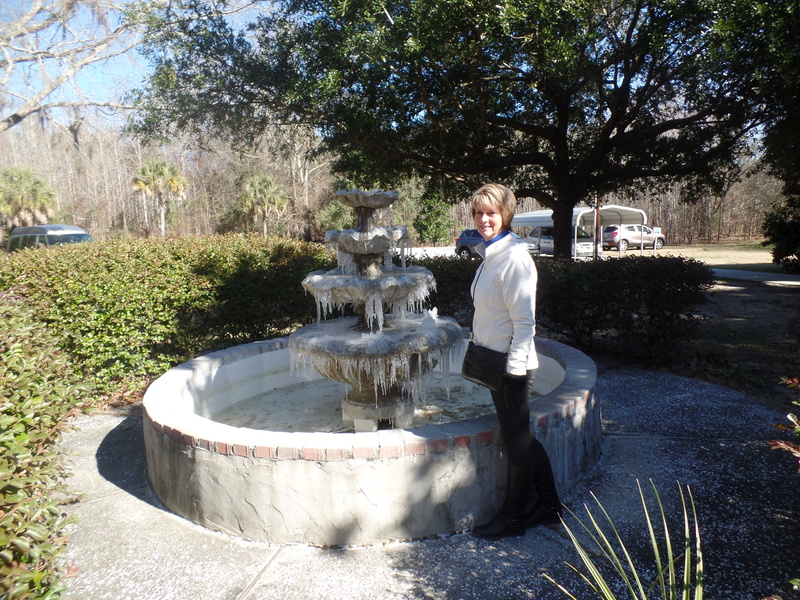 It gets cold in the Low Country too! The house was mainly a gift shop and we saw several things that we would like for the river but didn’t make a purchase. We may go back tomorrow. The docent was English and gave us several suggestions for touring Beaufort. Next we toured the Historic Country Store, a general store with original peach and cherry cider. It was filled with different kinds of cider and many canned fruits and vegetables. We sampled some cider but didn’t find any that we particularly liked. I had hoped we’d find hot cider but we didn’t. We also sampled some delicious relish. It would be great on hot dogs or collards. Again, we may stop by there tomorrow and get some. Next we headed to Beaufort which is about 16 miles away. Our first stop was Lowe’s. By this time I was warm and just a bit sleepy so I decided to stay in the car while Jerry went in. He stayed so long that I took a little nap and then ended up writing a brief recommendation for someone. He bought a quartz heater and some breakers for the motor home. He can use the heater in the workshop although I think we need to be sure we have it in the motor home when we travel. You never know when you might need it. Our next stop was Walmart for the battery charger. We also got a few groceries including some pork chops for tonight’s dinner. We then went on in to Beaufort. I thought it was a sleepy little town but it isn’t. To be a tourist town on the water it surely is busy with a lot of traffic, much different than what I expect Atlantic Beach is this time of year. We went to the Visitor’s Center and again the guide gave us some ideas. While we were there I got a call from Robbie Booth. He just got a 2006 diesel pusher, 39 feet with a washer and dryer and wondered if we’d be interested. He texted me the floor plan and it isn’t anything we’d be interested in. IF and yes, that’s a capital IF we get another I’d like a bath and a half although we’ve only had a problem with only one bathroom once but it was a real problem that time! The coach also has a dinette and I don’t want that. Although it doesn’t have a fireplace Robbie said he could put one under the TV. I told him we were traveling and on the way to the Tampa show. Wonder if that’ll light a fire under him to find us something not that we’re really that interested. I’m satisfied with what we have except for the kitchen counter space. After leaving the Visitor’s Center we walked to the end of the block trying to decide where to go. We quickly realized that it was just too cold to wander about so we headed by to the car. We rode around and looked at some of the gorgeous old homes, then rode down the main street of Beaufort. There appeared to be some nice shops there but I’m not interested in shopping so we didn’t stop. Our next stop was the gas station. We didn’t fill up the car in Latta thinking that it would tow more easily and cheaper with an empty tank. We couldn’t find a Hess station so we ended up stopping somewhere that had gas for $1.91 – cash, not card – the sign was a little misleading. We then headed back to the RV with a stop by the Old Sheldon Church ruins. We got turned around somehow and ended up taking a turn that led us straight to a dead end with a sign saying “Your GPS is wrong. This is a deadend”. Apparently it happens frequently enough to warrant a sign. We finally saw the ruins of the house. We didn’t even get out of the car. We had seen an old ruin while we were in Virginia! Headed on in and Jerry started working on changing the breakers. I called Mary Ann to wish her a happy birthday and then called Ruth to wish her a belated birthday. Dinner consisted of pork chops on the Foreman and boy were they good. After that I checked my e-mail and had one from Tideland. Our check didn’t go through due to an incorrect number. I immediately replied explaining the difficulties with changing from Bank of America to First South. Then I tried to get online to resubmit the amount. I couldn’t amend the number on the iPad app and I couldn’t get online for the web based site. Frustration. I’ll try again in the morning and if that doesn’t work I guess I’ll call and have it put on the credit card. Argh…..
A quiet night, no television – nothing worth watching and I guess there must not be any kind of game on because Jerry isn’t watching it either. We’ve already got the water dripping again tonight. It’s 9:47 and 28 degrees with an expected low of 23. It’s already 19 in Kinston though with an expected low of 15. No, we didn’t get far enough south to avoid the bitter cold but at least it’s not quite as cold. Our original plan was to leave by 8:00 on Friday morning. I can’t imagine going out to the warehouse and starting up the RV in 15 degree weather. It would take forever for the inside to warm up if it ever would! Glad we came on early. Have no idea what the plans are for tomorrow although Jerry said we’d be out and about earlier. We’ll see about that!